So, how did this all get started? 1971 • Stu Stuart starts collecting beer cans at age 8 in Rochester, Michigan. 1972 • Becomes the youngest member of the Beer Can Collectors of America, membership #1425. 1976 • Learns to drink beer at Lost Lake Boy Scout Summer Camp. Of course they don’t offer that merit badge, anymore. 1979 • Becomes Eagle Scout. 1986 • Moves to Seattle during the rise of the craft beer movement. Thomas Kemper, Red Hook and Grants breweries are turning heads. Stu teaching his Belgian Beer Me! beer appreciation class in Philadelphia. 1987 • Gets introduced to his first Belgian beer... Chimay Red Label by girlfriend, is hooked on Belgian beers and continues to seek out and try new ones. 2004 • Goes to Belgium for the first time on a beer tour with Mike Saxton and Marty LaFave (who would later become a guide for BBM!). 2005 • Returns to Belgium to enjoy the beer and beer culture. 2006 • Belgium calls again. Marty LaFave (L) and Stu at 2010 Winter Olympics in Vancouver promoting BBM! 2007 • Belgian Beer Me! Beer Appreciation Class begins at the ASUW Experimental College at the University of Washington in Seattle (The same place Rick Steves started his travel class in the 1970s). The BBM! class is is a big hit and popular. Students suggest that since Stu knows so much about Belgian beer and Belgium that he should consider leading beer tours. 2008 • Stu appears for the first time as a guest on The Brewing Network. Since then has been on several times. 2008 • The first “Lonely Monks Trappist Tour of Belgium” goes in October. It consists of Stu and three people driving around Belgium in a Volvo station wagon. Good times! 2009 • Belgian Beer Me! 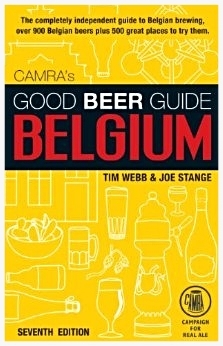 Beer Tours of Belgium is featured in the Good Beer Guide Belgium, the premier beer guide book for Belgium, by Tim Webb. 2010 • Stu visits Bamberg, Germany, for the first time and falls in love with the beer city, the beer and the region. This region has the highest concentration of breweries in the world and an equally amazing beer culture and history to go with it. 2011 • BBM! gains in popularity and more tours are offered. 2011 • BBM! expands to create Bamberg Beer Me! offering two tours each year-- The Spring Beer Garden Tour of Bamberg: Rauchbier and Beyond and the Fall Bock Beer Tour of Bamberg. 2013 • Stu appears as a guest on Travel with Rick Steves radio show and podcast. Rick interviews Stu about Belgian beer and beer travel in Belgium and Bamberg. 2014 • Belgian Beer Me! is featured in the Good Beer Guide Belgium, once again, making it the only U.S. based beer tour company to be listed in two editions. This edition authored by Tim Webb & Joe Stange. 2014 • The number of tours offered each year continues to increase to take in the many beer opportunities Belgium has to offer, including numerous breweries, beer festivals and rustic beer cafes. 2014 • BBM! and Stu are recognized by and invited by the New York City office of Visit Flanders to participate in a promotional tour of Belgium and travel show for tour producers, where more contacts and relationship with breweries and vendors are made. 2014 • Michigan Beer Guide and Publishers Rex and Mary Halfpenny partner with BBM! on the Lonely Monks Trappist Tour. Rex shares his passion for and encyclopedia-like knowledge of beer with the group and writes an article for the Michigan Beer Guide chronicling the tour. 2015 • Celebrator Beer News and Editor & Publisher Tom Dalldorf partner with BBM! for a special edition of the Legendary Zythos Beer Festival Tour. The tour sells out. Tom writes a great article about the tour. 2015 (2017) • Beer writer Chuck Cook, “The Belgian Beer Specialist", participates in the Wild and Spontaneous Tour and provides a font of beer information and stories for travelers. He writes a great article about the tour which appears in Celebrator Beer News and his website Drinkbelgianbeer.com. The Legendary Zythos Beer Festival Tour Celebrator Beer News Edition '15. Celebrator Publisher Tom Dalldorf front row, right, next to Stu in Hawaian shirt. 2015 • BBM! offers 12 tours to Belgium and three tours to Bamberg, including the new Belgian Family Brewers Tour, Montana Alumni Beer Tour and Oktoberfest & Bamberg: Best of Bavaria Tour. 2015 • BBM! launches a responsive, modern, intuitive, user-friendly website featuring beautiful images of Belgium and Bamberg, beer, food, attractions and beer tours. Travelers can view tours and decide on one by name, theme or calendar dates. Sign up is made easy, online and paperless. Travelers may pay online with with a credit card and get air miles. The new website promotes tours of Belgium and Bamberg, Germany, in one convenient place. It’s never been easier to review all the tours offered by BBM!, decide on one or two, then sign up! 2016 • BBM! announces three new tours: Backroads of Belgium Beer Tour, Mini Trappist Tour and the Summer Beer Tour of Belgium. And, an August departure of the popular Lonely Monks Trappist Tour. There are now 18 tour departures from which to choose. 2017 • BBM! announces a partnership with Ale Street News and Editor & Publisher Tony Forder for a Beer Tour of Brazil. BBM! also teams up with Berkshire-Hathaway Travel Protection to better serve the needs of travelers. 2018 • BBM! features 20 tour departures. 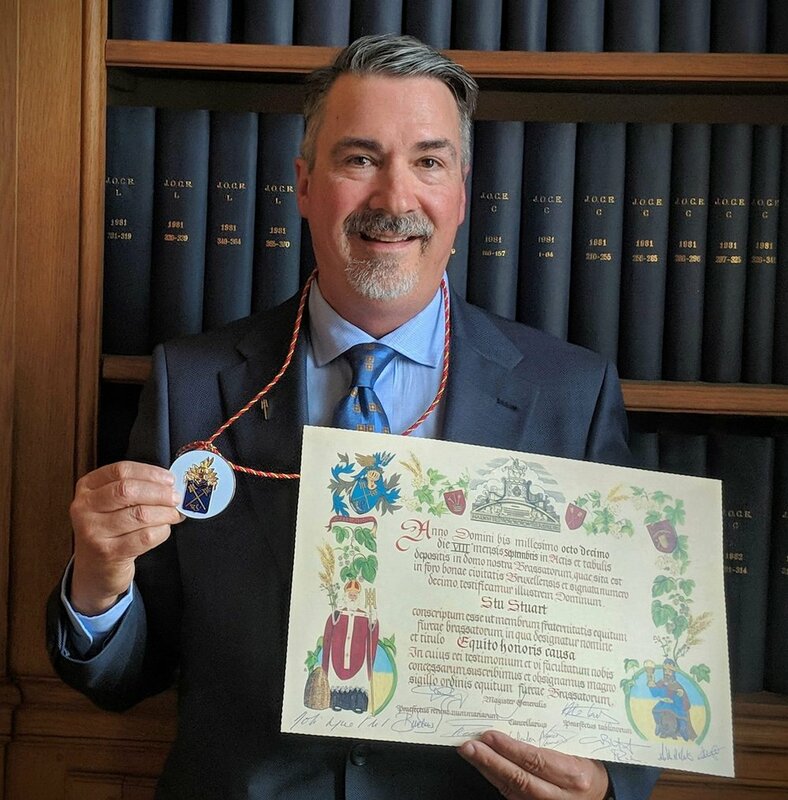 2018 • Stu Stuart becomes an Honorary Knight of the Knighthood of the Brewers Mash Staff in an enthronement ceremony that took place Sept. 8, in the Brewers Guild House on the Grand Place of Brussels. This exceedingly rare honor was bestowed upon him for rendering loyal service to the brewers of Belgium. It is reserved for those who make an important contribution to the Belgian beer industry, either commercially, politically or socially, and who can therefore present themselves as ambassador for Belgian beer. Typically Honorary Knights are importers, grocery store chain owners, politicians and an occasional beer writer. This is the first time a member of the beer tourism community has been recognized with an invitation to become an Honorary Knight. Stu is the third person from Michigan to receive this honor.